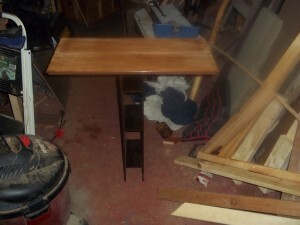 I have been busy today, the shutter table needs constant sanding and cleaning and lacquer spraying. Between coats I have been working on three other projects. I finally out the base for the toboggan table together and I made a new table out of drawer fronts and a desk insert. First the Toboggan. I had planned on using a pair of these 3 sided legs , but I like the way it looks with just one. To keep that shape I had to toenail 6 screws and install a mending plate. Jess is concerned that people will think it is a bench because it is so low. It is not a bench and I don’t know if the legs could support the weight of a person. I will reinforce it some more. I have been playing with drawer fronts too. We made a table at work this weekend. We are putting in a repurposing idea center. One of the things we will be doing is using old drawers as shelves I made a prototype shelf out of an oak drawer today. I also made a table. I had intended on leaving the Knobs on but I like the lines of the piece without them. 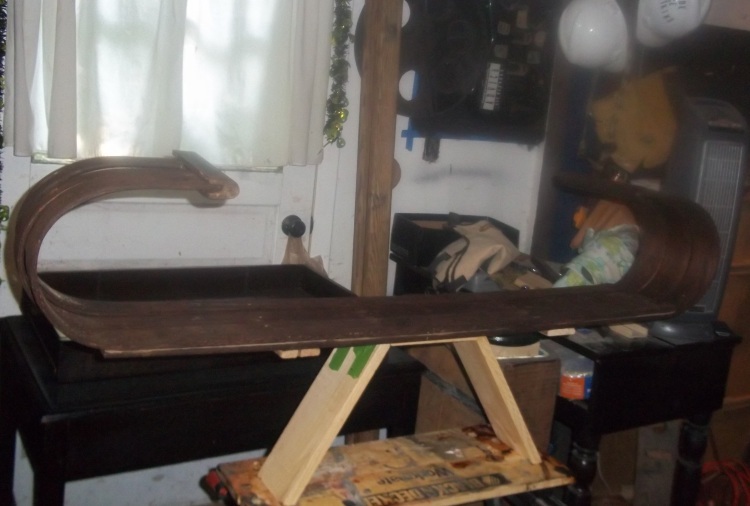 I took out the knobs, sanded the pieces, installed dowels in the knob holes, sanded again, and then arranged the two planks on the top of an old desk insert. Joinery will happen tomorrow and then I should have that table into the shop by Monday. I have been fixing a chair for my sister-in-law for months now and I am in the end stage of that project too. This entry was posted in scrap wood, tables, wood working by brighid. Bookmark the permalink. Really like the shape of the legs on the tobaggan table and the supports for the drawer are an old desk insert – the kind that people used to organize the contents of their desk? It looks really cool.